For the most part the effects are flawless, but you may notice some curious font issues with groups of browser tabs and various apps, whether or not that is acceptable to you is your choice. If you decide it’s not tolerable, you can remove Lucida Grande and restore the default system font just as easily as setting Lucida. 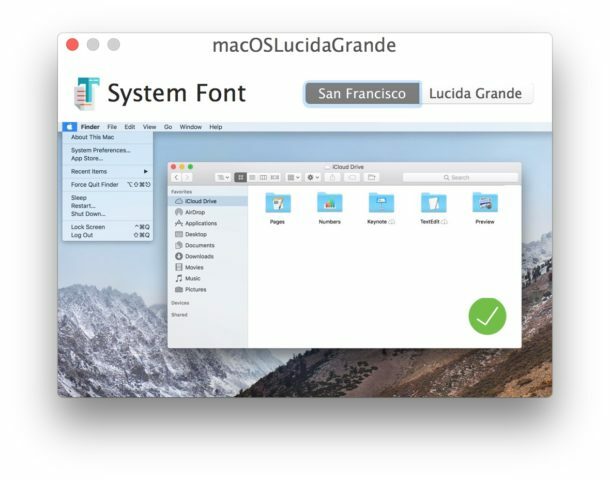 If you decide you’re not into Lucida Grande on the Mac, you can easily change back to the High Sierra default system font of San Francisco again. The steps are basically the same as installing Lucida Grande, but choose “San Francisco” from the app instead. I don’t desire a change of the system font – what I want to restore the ability to change Safari’s font. I’ve pretty much quit using Safari over it’s font. Tried this, but had to uninstall. When activated, passwords become invisible. That is, the password input field will not even display dots when you type in it. Thought my Bluetooth keyboard had died for a minute. I had the same issue and reverted to the original font. It took me a few minutes to figure out why passwords were invisible. You can’t just uninstall the app to change the font back. 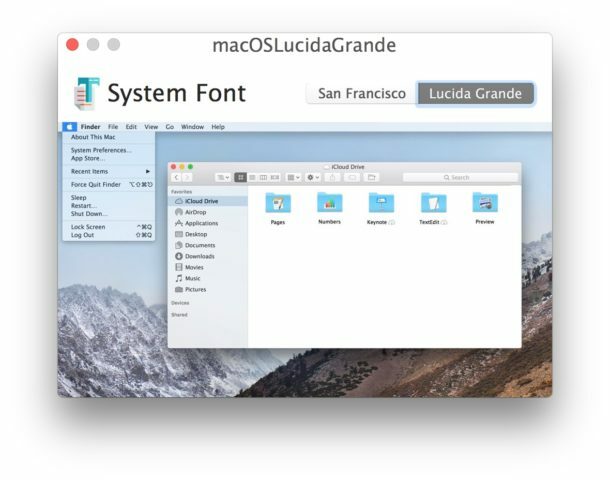 You have to open the app again and choose ‘San Francisco’ again as the system font to use, that will restore the original default system font. The reason is the app basically places a modified system font file into a user level system folder. So if you just delete the app, that font stays in place. You have to remove that font and replace it with the default system font again, which the app does by choosing “San Francicso” and clicking green install button. I had the same thing happen, fonts are jammed together, virtually unreadable tabs in Safari, previews in Mail also jammed together. What exactly did you restore, the system? Thanks. The article details exactly how to reset to the default system font. You can restore from a backup but that should not be necessary unless you messed something up separately. Both typefaces are awful. Check out Input from Font Bureau. Free for personal use (like this very thing). A few versions old, so use with caution. Can Input Sans be used for High Sierra? It shows older versions of Mac OS as the support. San Francisco was created in part to make the system font easier to read. Why go back to Lucida Grande? Clicked on your links and none of them returned what you reference in your instructions. nah… I like SF PRO Display better than Lucida Grande. and this is easier to do, without having to install a 3rd party app. 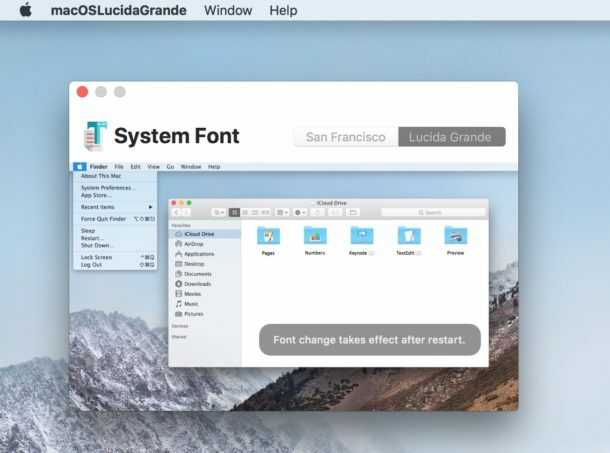 Sounds interesting, how do you use SF Pro Bold for system font in MacOS? I’m one of those old school System 6/7 users who likes his Finder just the way he found it. But, for some reason I actually like San Francisco even though it can look a bit awkward in some places. It seemed to make the “back to the future” 2-D look of the current macOS more paletteable. Has anybody noticed that macOS and iOS seem to be ever so subilty adding a hint of “skeuomorphisms“ compared to the initial Yosemite ”hello kitty” yuck of 2014? I still want the old Trash can though. I don’t care what Apple HIGs it breaks. The Dock could still look cooler. I think Mavericks was the peak of the look except for the leather Calendar. Just keep toning down the pinks Apple. Back to blues, greys, blacks and whites. No more pink. Maybe Apple will slightly update the look again when the iMac Pros and Mac Pros hit the streets. Anyway, sorry to get off topic. I hear that Apple is working on an exclusive Hello Kitty iMac Pro in hot pink and all decked out with sparkly things stuck to it. I did it… looked cool, then when I restarted, not only was password not entering, typing invisible password was still incorrect. I cant get into my computer now. Having to reinstall OS and hoping I can get in so I can promptly delete this program. Lucida is not worth all this trouble.